After the ECROFI 22 conference (2013) the Kisladag Au mine was visited. The opportunity was taken to collect samples for baro-acoustic decrepitation analysis to compare the fluid inclusion assemblages from this deposit with that of many other gold deposits shown elsewhere on this website. 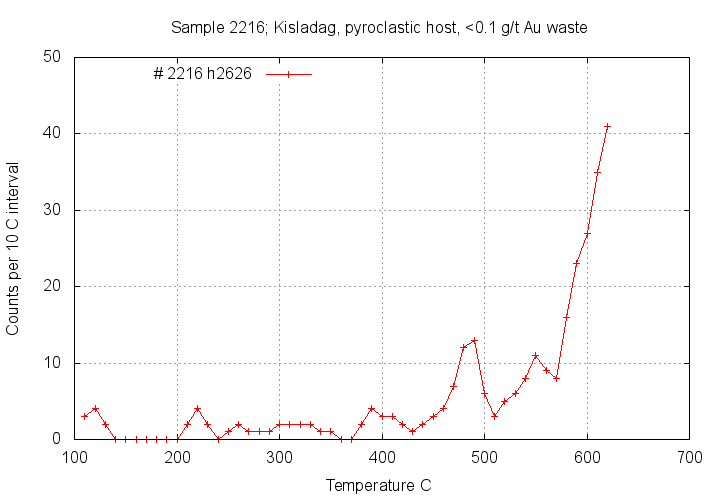 The samples from Kisladag show only very weak decrepitation, probably because of sub-optimal samples with insufficient quartz. The ore zone samples do show weak, narrow decrepitation spikes at 400 - 500 C which may be related to either sulphides or the pervasive silicification of the ore zone. The late stage 3 barren intrusive in the core has a broad and more intense decrepitation due to feldspars. 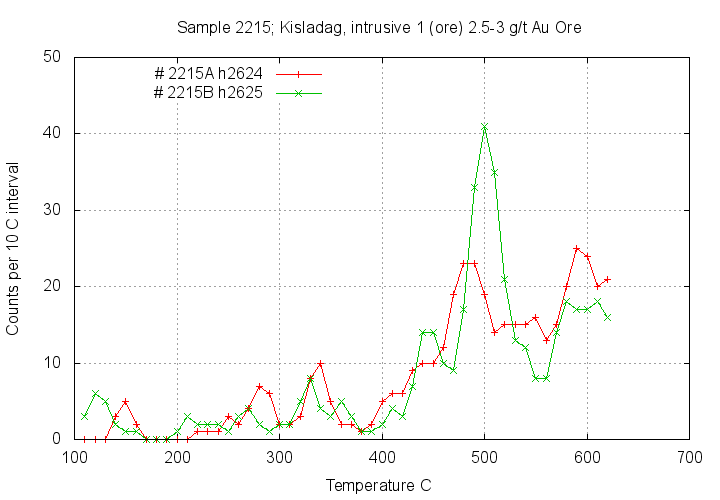 The fluid inclusion decrepitation study at Kisladag has not not clearly identified an ore-related fluid inclusion event, but there is a suggestion that more carefully collected samples might be able to recognize such an ore related event. 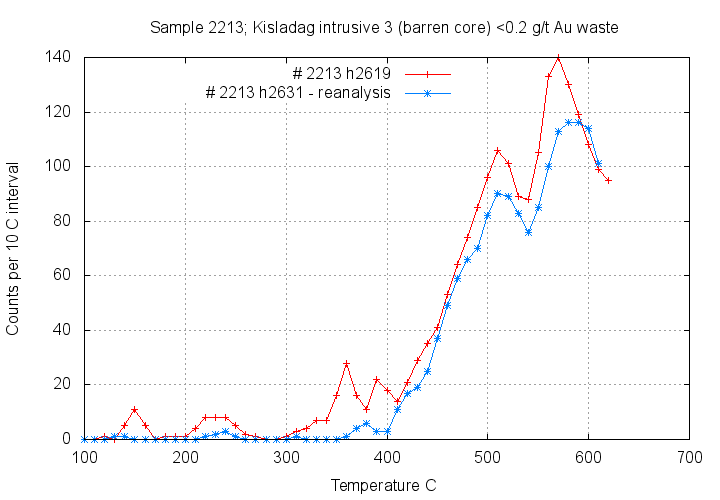 Without more carefully collected samples this study indicates that decrepitation is difficult to apply in exploration for the Kisladag deposit. The following geological information is from the ECROFI 22 field trip guide, 2013 by Huseyin Ozturk & Zeynep Cansu. The Kisladag mine is located in west-central Turkey. Within the deposit area, the main lithologies that have been logged and mapped by Eldorado Gold Company are quartz—trachyte to quartz-latite flows and volcanoclastic rocks intruded by a series of nested subvolcanic porphyritic intrusives of alkalic affinities. Based on the intensity of alteration, mineralization and cross cutting relationships three mineralized intrusives (Intrusions 1, 2 and 2A) and one post mineral body (Intrusion 3) have been identified. West of the open pit the schistose basement has been intersected in a number of drill holes and outcrops of basement rocks have been mapped north and west of the leach pad area. The basement schist varies from a fine grained mylonite to coarse augen gneiss with rounded porphyroclasts of orthoclase. The schist is composed dominantly of quartz, plagioclase/albite and white mica and contains quartz veins that have been affected by the intense deformation. In the vicinity of the open pit the foliation has a shallow dip to the south—east. Elsewhere on the property the dips are dominantly flat lying but may show a rapid transition to steeply dipping. The volcanic rocks on the upper benches of the pit and in drill holes on the south side of the pit vary in texture from fine grained fragmental ash fall tuffs with pumice fragments to porphyritic flows with flow banding and auto brecciation. Eight hundred metres east of the pit two diamond drill holes intersected a number of fine grained plagioclase-hornblende porphyries with interlayered ash fall tuffs. The porphyries have been propylitically altered and it is not clear if they are intrusive bodies or flows. The Çukuralan Au deposit is in the Bergama (İzmir) region of western Turkey. The deposit is a low sulphidation epithermal deposit (similar to the Ovacık-Au deposit (40 km southeastof Çukuralan) occurring within the porphyritic dykes that cut the local metamorphic sequence known as Karakaya Complex. The gold grade varies between 0.5 and 50g/T, with mining from an open pit. Mineralisation at Cukuralan is related to porphyry dykes which were formed at the same time as the tectonics which caused ductile deformation. It is uncertain if the gold is derived by leaching of the regional Permian aged metamorphics during later Miocene aged magmatic events. It is thought that the mineralisation is related to the intrusion of porphyry dykes. The gold deposition is primarily lithologically controlled by reducing host rocks, but deposition also occurs without lithological control. Quartz, and calcite occur as gangue minerals. The mineralisation is structurally controlled and occurs along 2 different fault systems oriented NE-SW (younger) and NW-SE (older). The contact between volcanoclastics and intrusive 1 is difficult to define due to the intensity of alteration but is steeply inclined and often marked by a tourmaline rich hydrothermal breccia. Intrusion 1 is the oldest, and generally, best mineralized porphyritic intrusive phase. It forms the core of the system, and is cross cut by the younger porphyritic intrusions. it forms a slightly elliptical body approximately 800 m across, which was exposed at the pre-mining surface. Recent drilling indicates the roots of Intrusion 1 lie on the southeastern side of the pit. In the western half of the deposit, the basement schist is encountered in deeper holes, at depths of 200 m to 350 m, and to the west of the proposThe Çukuralan Au deposit is in the Bergama (İzmir) region of western Turkey. The deposit is a low sulphidation epithermal deposit (similar to the Ovacık-Au deposit (40 km southeastof Çukuralan) occurring within the porphyritic dykes that cut the local metamorphic sequence known as Karakaya Complex. The gold grade varies between 0.5 and 50g/T, with mining from an open pit. ed pit outline, Intrusion 1 may become sill-like in form, lying above the schist, and not coming to surface. Contacts between Intrusion 1 and the surrounding volcanic rocks are generally obscured by alteration. Contacts with younger intrusions, particularly Intrusion 3 are better preserved. Intrusion 1 comprises abundant phenocrysts in a K-feldspar dominant groundmass. Plagioclase is the dominant phenocryst phase, comprising up to 30% of the rock by volume. It occurs as tabular crystals ranging in size from <1 mm to 5 mm. Biotite is the second most abundant phenocryst phase, comprising up to 10% of the rock. It is typically finer grained than plagioclase. Blocky megacrystic K- feldspar phenocrysts, up to 1 cm, are a characteristic of this unit, but are low in abundance. Quartz phenocrysts are rare. Based on the primary mineral assemblages this rock would lie in the quartz-syenite to quartz-monzonite fields. Intrusion 2A occurs in the southeast corner of the pit, where it intrudes the margin of Intrusion 1. It forms a circular stock 250 m to 300 m across. It appears to taper at depth. This unit carries economic gold grades, but is not as well mineralized as Intrusion 1. It is a fine to medium-grained porphyritic rock. intense pervasive clay-quartz alteration appears to have selectively overprinted this unit. The unit contains a significant amount of plagioclase phenocrysts (“‘20%), up to 2 mm in length, and possibly sparse quartz phenocrysts. This unit is very similar to texture to Intrusion 2, but is differentiated because of the intense clay alteration, which does not affect Intrusion 2. Intrusion 2 occurs as two separate semi-circular stocks, both approximately 150 m to 200 m across. One occurs in the center of the pit, cutting the core of Intrusion 1, and the second occurs on the northwestern margin of Intrusion 1. Both intrusions are in contact with Intrusion 3, and there are large fragments of schist along the margin of the northwestern stock. The stocks carry economic gold grades. The rock is a fine-medium grained porphyry. It is comprised of abundant (20-30%) plagioclase phenocrysts up to 2 mm in length in a dominantly K-feldspar groundmass. No quartz phenocrysts were observed. This unit can be weakly-moderately magnetic. Compositionally this unit would lie in the syenite — monzonite fields. Intrusion 3 is the youngest intrusive body at Kisladag. It forms a semi-circular stock near the center of Intrusion 1, west of the central Intrusion 2 stock, and extends into an elongate, steeply dipping to vertical dyke-like body to the west, extending beyond the limits of the proposed pit. It has been traced at least 450 m west of the pit. The contacts of this unit with other rocks are generally well preserved, and the drop in gold grade is abrupt at the contacts. It is a fine grained porphyritic unit, comprised of 20% to 30% plagioclase phenocrysts, up to 4 mm in length, sparse quartz and biotite phenocrysts (both <5%), and amphibole phenocrysts (5-10%). The amphibole phenocrysts have been preferentially altered to secondary mafic minerals, but their prismatic shapes are preserved. This intrusion is typically magnetic, due to the presence of very fine grained disseminated magnetite in the groundmass. The magnetite is probably a primary component of this unit. Its bulk composition places it in the quartz-syenite - quartz-monzonite fields. - Late sulphide rich quartz veining with traces of molybdenum, sphalerite, galena and tetrahedrite (± gold). In general, the amount of stockwork veining decreases with depth, especially below 650 masl elevation. Higher—grade mineralization (above 2 ppm Au) has been traced from surface to depths greater than 250 m below surface. Lower—grade mineralization, grading between 0.5 and 1.0 ppm Au has been traced to the deepest levels drilled on the property approximately 600 m to 700 m below surface. Tourmaline is locally abundant in every phase of mineralization except the late vuggy silica. it typically occurs as very fine, anhedral grains disseminated in the host rock and silica gangue. Pyrite is the dominant sulphide mineral present with visual estimates averaging around 4% in the primary ore zone. Locally as much as 15% pyrite can be present. Other sulphide minerals identified in microscopic studies include chalcopyrite, sphalerite, tetrahedrite, galena and molybdenite. Oxidation tends to be deeper on the uphill (southern) side of the deposit (from 30 m to 80 m deep) as compared to the downhill (northern) side of the deposit, where oxidation is limited to between 20 m and 50 m below surface. There is also a broad east-west trend, with slightly deeper oxidation on the east side (50 m to 100 m) versus the west side of the deposit where oxidation ranges from 30 m to 60 m deep. Limonite is the most abundant oxide mineral, usually occurring along fractures in thin colloform layers and as disseminated patches around weathered pyrite and mafic minerals. A potassic assemblage characterized by secondary biotite, and focused on Intrusion 1 forms the core of the system. Tourmaline is present throughout the deposit, and in all phases of intrusions, but is most common in the volcanic rocks adjacent to Intrusion 1 and forms an outer alteration shell. An advanced argillic assemblage characterized mainly by alunite occurs on the outer margins, beyond and overprinting the tourmaline, partially capping the deposit and extending to depths of up to 350 m on the eastern side of the pit. A pervasive retrograde argillic assemblage of clays +/- chlorite—montmori|lite overprints all other alteration, and can extend to depths of 600 m. Surface clay weathering and oxidation is also present, and locally extends to depths of 250 m on the outer margin of the deposit. It may in part be preferentially developed on zones of advanced argillic alteration. Disseminated pyrite is ubiquitous, and may have been introduced which each stage of hydrothermal alteration, particularly the potassic and argillic stages. There is no propylitic alteration (chlorite-calcite-epidote) in or immediately adjacent to the deposit. The alteration mineral assemblages associated with the deposit were formed by a complex interaction of hydrothermal and meteoric fluids. Each intrusive event contributed a high temperature phase dominated by magmatic fluids and vapours followed by a retrograde cooling stage associated with meteoric water telescoping in on the earlier alteration. 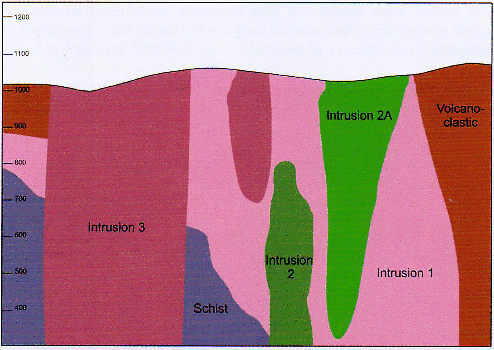 Representative E-W cross section showing the relationship between the intrusives. 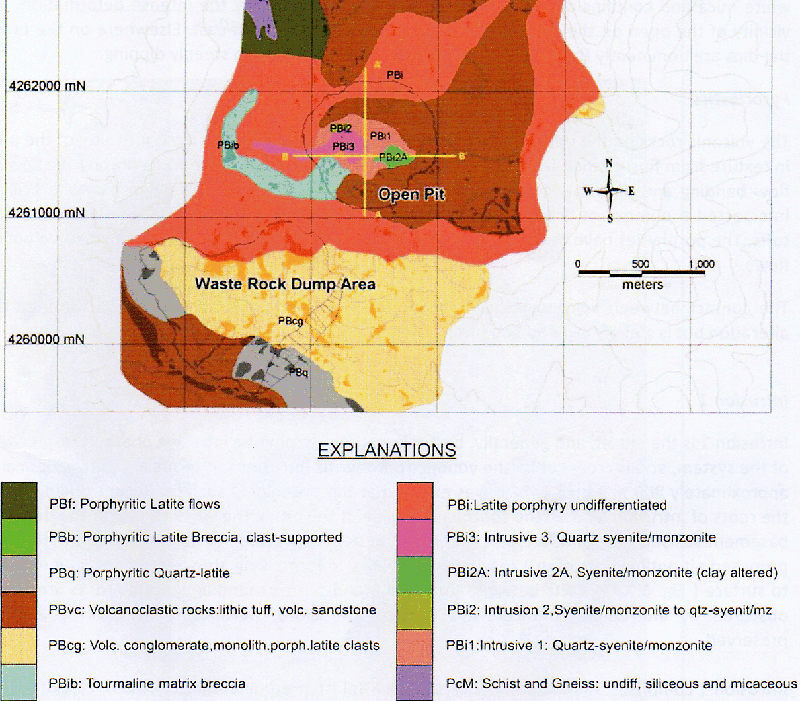 Another cross section with the pit outline and grades is on the Eldorado mines website. A suite of samples were collected from representative rock types within the mine. These were provided as piles of each different rock type in the viewing area of the mine as it was not possible to access the pit. The precise locations of each sample are unknown. Where possible multiple samples from each material were collected and analysed separately and plotted together. These were analysed by baro-acoustic decrepitation as described elsewhere on this website. The Kisladag mine rocks are quartz deficient and are not ideal materials for decrepitation. However decrepitation is applicable to other minerals such as fresh feldspars, magnetites, sulphides etc and these analyses were done as a trial to see if there was a detectable fluid inclusion signature associated with the ore zone. The pervasive silicification of host rocks can sometimes also preserve fluid inclusions which can give a useful decrepitation response. All of the results are of very low intensity, despite the use of double the normal sample size in this study. This is consistent with a magmatic origin with a restricted hydrothermal fluid overprint and lack of quartz veining. Intrusive 1, sulphide bearing main ore zone. Both samples contain a distinct sharp peak at about 500 C. This is not present on any other samples. This might be an ore related response or it may also be caused by sulphides which typically give narrow decrepitation peaks. But note that the sulphide observed in intrusive 2A (below) does not give a decrepitation peak at 500 C.
The 3 sub-samples have only a very weak response and lack similarity. 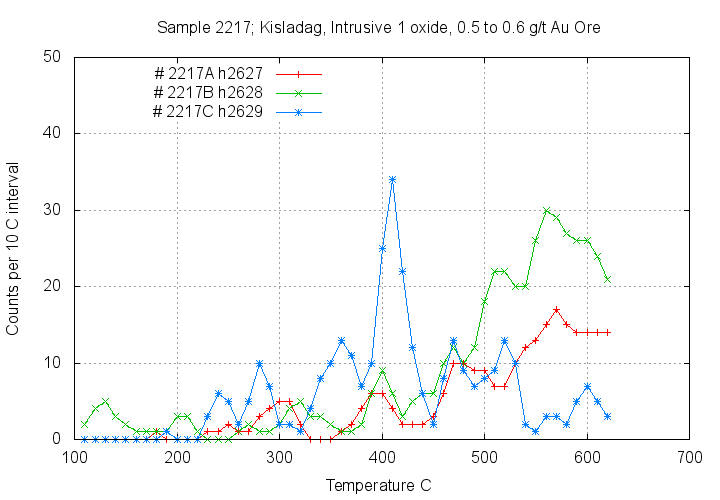 Perhaps the peak at 400 C on sample h2629 is due to residual sulphide, but it is interesting that it is at 400 C not at 500 C as in the above results! There is no significant response in these 3 samples. Perhaps the gradual rise in sample 2214C (blue) is due to fresh feldspars. It is interesting that although sulphides were observed in the hand specimen during preparation, there is no peak at 400 or 500 C as in intrusive 1. Perhaps sulphides are not the cause of those peaks!! These 2 results are actually a repeat of the same sample. h2619 was analysed on 0.5 gm of sample and mathematically doubled for comparison with h2631 which was an analysis on 1.0 gm of the identical sample. This response looks like quartz, with some feldspars as well and is much more intense than the other results in this study. The peak at 500 C is much broader than in intrusive 1 above and probably due to quartz rather than sulphide. This material has only a weak response around 600 C which is probably due to fresh feldspar. This is the regional background signature from these unmineralised rocks. 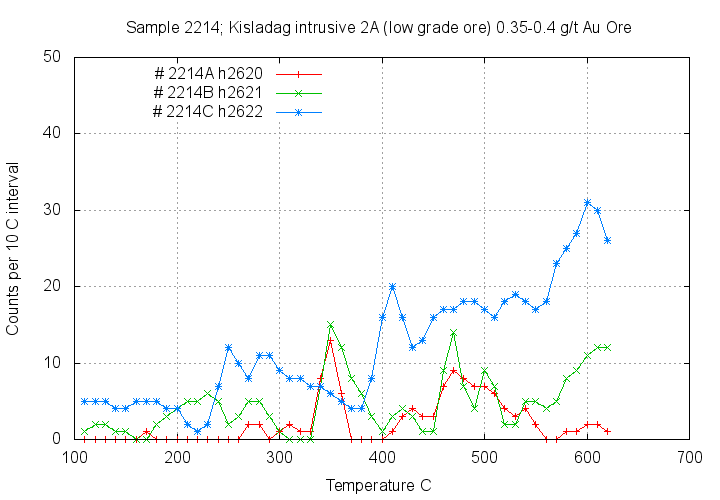 The samples from Kisladag do show some decrepitation from fluid inclusions, but the responses are very weak. Given the known lack of quartz veining in the system and the lack of visible quartz veining in the samples collected, the weak decrepitation response is to be expected. Although there is reportedly a pervasive silicification within this deposit, this was not visible on these samples. Although baro-acoustic decrepitation can detect inclusions in such silicified zones it has not done so in this study, which may be due to inappropriate samples. It seems that aqueous fluids may have had only a restricted involvement in this mineralisation. There is a small and unique decrepitation signature in intrusive 1 in ore material which might be related to the Au mineralising event. However, there is not really enough data in this brief survey to be sure of this. Additional, well located samples from within intrusive one would help to discern whether decrepitation could assist in exploration for or outlining of the kisladag mineralisation type.